Built exclusively for big game, the MAKO Spearguns High Performance Pole Spear Slip Tip is precision machined in our South African Spear Factory. Finely tuned to sit tight and release when needed, it includes a super sharp tri-cut tip and welded fingernail for maximum penetration and holding strength. 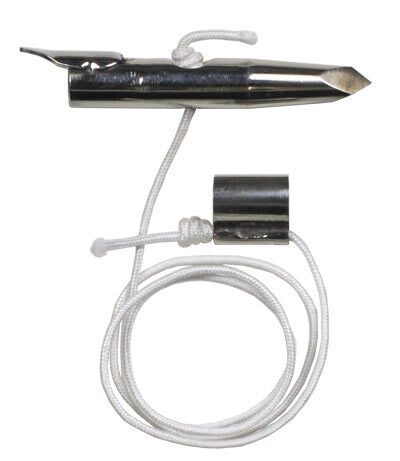 The MAKO Spearguns High Performance Pole Spear Slip tip also includes high strength dyneema cordage which is easily replaceable thanks to the high quality precision machining. Also includes latex tube ring and zip tie for holding slip tip in place. Application: Large Fish (over 50 lbs +) both open water species such as jacks as well as, large grouper etc. Note: The 12 inch Pole Spear Injector Rod for Slip Tip is Required when using the High Performance Pole Spear Slip Tip. This 12 inch Injector Rod is made from 17-4PH Stainless steel hardened to 42 rockwell. It has a male thread 5/16” on one end to connect to your pole spear and includes a “slide ring stopper pin”. The Slip Tip connects to the Big Game Pole Spear using the 12" Slip Tip Injector Rod.